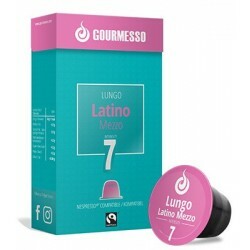 Capsules compatible Nespresso LUNGO LATINO MEZZO of the brand Gourmesso with an intensity of 7. This compatible dosette perfectly combines 3 arabicas and a fine touch of robusta. The arabicas are of origin of South and Central America the robusta comes from Vietnam. 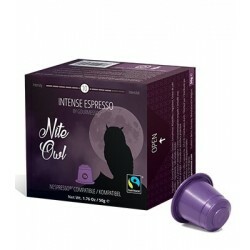 This espresso meets all fair trade requirements and is certified by Fairtrade. Brasile blend dolce, Nespresso compatible capsules by Gourmesso. This compatible pod is an assemblage of Brazilian arabicas and Indian blends to obtain a delicate aroma with citrus notes all in exquisite softness. 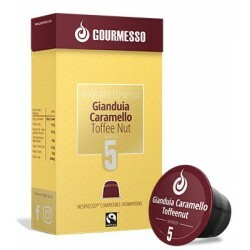 Nespresso ® Biscottino compatible capsules from Gourmesso. This espresso is the result of a wonderful alliance between the flavor of Cookie and the creaminess of an espresso. An intensity of 5 this capsule of character has been perfected with notes of Cookie. 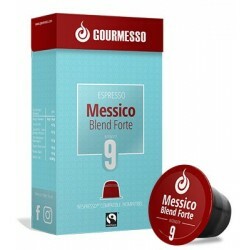 Messico blend strong capsules Gourmesso compatible Nespresso intensity 9. Compatible dosette having a rich and powerful flavor with a savant mix of Mexican and Indian arabica. Messico blend strong from Gourmesso is a Fairtrade fair trade coffee. 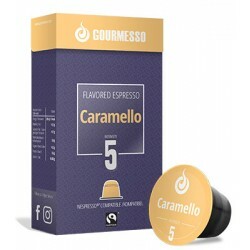 Nespresso compatible Capsules. This decaffeinated pod for Nespresso is made up solely of arabica of Peruvian origin from organic farming. In intensity of 3 this deca of peru benefits in addition to its sweetness a subtle chocolate fragrance. The cultivation of these coffee beans meets the fairtrade standard, fair trade for the good of all.